Hello. My name is Biscuit. I've visited Killer Characters before, and my wonderful human Carrie Kennersly asked me come here and bark at you again today. As I've said before, I still don't understand too much about it, but Carrie tells me she's the human whose stories are being told in the Barkery & Biscuits Mysteries. See, Carrie's busy again today. She's always busy, of course, since she owns two great shops: Icing on the Cake, where she sells human treats that I never--well, almost never, and definitely never chocolate--get to sample, and Barkery & Biscuits, where she sells the amazing dog treats she developed as a veterinary technician. Not only do I get to taste those, but I also hang out a lot in the Barkery when Carrie's at her shops. And, yes, Carrie still works as a vet tech part time, so I also get to go the special doggy daycare place at the back of the veterinary hospital where she works. And that's not all. Carrie's gotten into solving human murders, of all things. People get killed in our town of Knobcone Heights, and Carrie's been figuring out who killed them. She was suspected of being the killer once a while ago... and in the most recent murder her special guy, veterinarian Dr. Reed Storme, was thought by the police to be the main suspect, or so Carrie told me. I like Reed. I also like his dog Hugo, so I didn't think Reed did it. Anyway, Carrie told me that whole story was told about in a book called Pick and Chews, the most recent Barkery & Biscuits Mystery, whatever that is. Maybe you should read it to learn about whether Reed's guilty. I hope not! 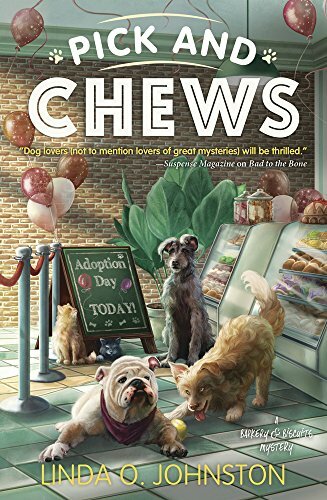 PICK AND CHEWS, the fourth Barkery & Biscuits Mystery by Linda O. Johnston, is a May 2018 release from Midnight Ink. Thanks for the update, Biscuit! Arf, arf... er, I'd love to anytime! I agree with Biscuit; Reed is not guilty. I'd like to see how Carrie solves the case. Carrie assures me that the answers are in Pick and Chews. I trust Reed. He's a vet. He's a good guy. Thank you. I do consider myself an expert on some things--like people.